The AMERICAN AUDIO Versadeck is a 2-channel Midi Controller that includes Virtual DJ LE software so you can start DJing right out of the box. Versadeck includes a built-in 4x4 Audio interface, two USB slots for thumb drives or hard drives *, two microphone inputs and XLR balanced outputs. Versadeck main functions include: 5 On-board effects (Echo, Flange, Filter, Skid, Scratch), Auto BPM Counter, 3-Band EQ with push Kills, Key lock, 4 Hot Cue or Loop Buttons, Relay Playback and a wide pitch adjustment of +/-100%. The large, bright VFD display allows the DJ to see the screen from a wide angle and features 2 lines of text for track name and other Info, and a variety of important screen functions to keep you in the mix. Considering purchasing the American Audio Versadeck 2-Channel Midi USB Controller/Media player with Virtual DJ? Have questions? Ask people who've recently bought one. Do you own the American Audio Versadeck 2-Channel Midi USB Controller/Media player with Virtual DJ? Why not write a review based on your experience with it. 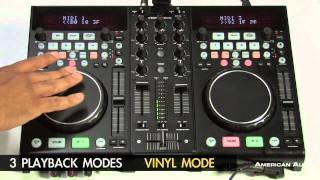 Seen a video for American Audio Versadeck 2-Channel Midi USB Controller/Media player with Virtual DJ online or have you own video? 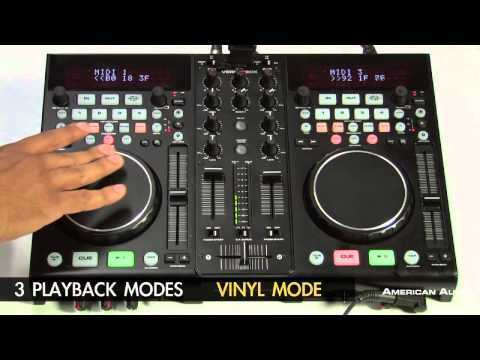 Check out American Audio Versadeck 2-Channel Midi USB Controller/Media player with Virtual DJ on DJkit.com!